I was hesitant to post this recipe as it is so simple it really doesn’t constitute as a “recipe”. That being said, I also know that quite a few of my clients consistently say that they would eat more vegetables if they knew how to cook them. Well, no more excuses! 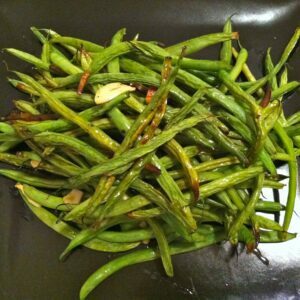 This recipe is easy, foolproof and delicious. 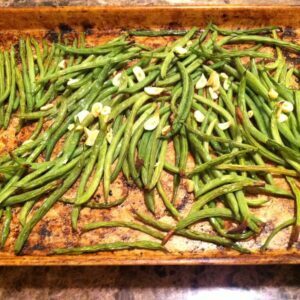 Preheat oven to 450 degrees F. Place the green beans and slivered garlic onto a roasting pan. Drizzle with the water and olive oil. Roast for 20 minutes. Season with salt/pepper and serve. Seriously, how simple is that?